Some important pieces of the US economic reports, including the latest nonfarm payrolls, have disappointed recently. May indicators (including the leading ones) have hit a soft patch it seems. Will that push the Fed to downgrade its dot-plot or fine-tune the monetary policy mix anyhow? Can gold jump in reaction to the Wednesday’s FOMC policy meeting? U.S. nonfarm payrolls plunged in February, falling way short of expectations. 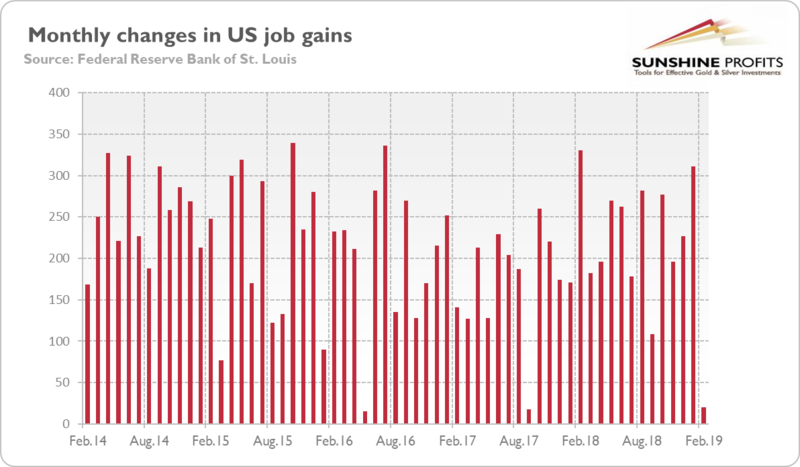 The economy added just 20,000 jobs last month, following a rise of 311,000 in January (after an upward revision) and significantly below 172,000 forecasted by the economists. The number was the smallest increase since September 2017, as one can see in the chart below. On an annual basis, the pace of job creation increased slightly last month to 1.8 percent. In my last article, “The Bears Have it Right: Economy went Polar Opposite of Bullish Predictions,” I laid out my first prediction for 2019 — a recession by summer. I don’t want the following revelations and facts that I have since come across to get lost in comments I recently posted to that article, so I’m bringing them all together here. Amazon.com Inc. abruptly dropped plans Thursday for a big new headquarters in New York that would have brought 25,000 jobs to the city, reversing course after politicians and activists objected to the nearly $3 billion in tax breaks promised to what is already one of the world’s richest, most powerful companies. Coresight Research released an outlook of 2019 store closures Wednesday, saying, there’s “no light at the end of the tunnel,” according to several reports, including one from Yahoo News. According to the global market research firm’s report, a mere six weeks into 2019, United States retailers have announced 2,187 closings of physical stores. That’s up 23 percent compared to last year. Those closings include 749 Gymboree stores, 251 Shopko store, and 94 Charlotte Russe locations. House Democrats are looking to double the minimum wage, with little eye to the consequences. Led by Virginia Democrat Bobby Scott, House Democrats introduced the Raise the Wage Act, which would more than double the federal minimum wage from $7.25 to $15 per hour by the year 2024. An education is supposed to prepare you for the future. Traditionally, that meant learning certain facts and skills, like when explorers arrived in America or how to calculate an answer using long division. Today, curricula have shifted to focus on a more global and digital world, engaging students in subjects like cultural history, basic computing skills, and writing code. Yet, the challenges our kids will face will be much different than those of our generation. Most of what a typical student learns in school today will no longer be relevant by the time they graduate from college. A study at the University of Oxford found that 47 percent of today’s jobs will be eliminated over the next 20 years.